For a while now I’ve heard many writers include Instagram as a productive part of their social media platforms. It’s not that I don’t love Instagram. Who doesn’t like pictures of delicious food, sun-drenched hills clothed in golden wheat, or ... well, you get the idea. But Instagram is a VISUAL medium. Writing ... not so much! Writing IS visual, but those images are internal, subjective. They are formed from our thoughts and ‘seen’ only in the minds eye. But writers WRITE. We produce text, not pictures! So how could Instagram be a good medium for us? That’s the question I set out to answer. 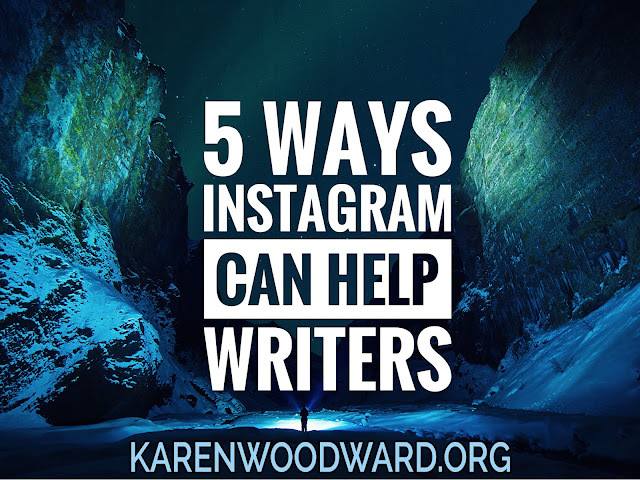 It turns out that there are an enormous number of ways using Instagram can benefit writers. Here are the top 5 I've come up with. 1. Instagram can help writers get personal. 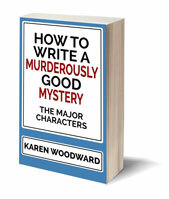 Many readers want to know something about their favorite writers. This doesn’t have to be ultra personal. - Share pictures of your office. Many of your readers would be thrilled to know what your office looks like (or even just your writing desk). - Share pictures of the books you’re reading. 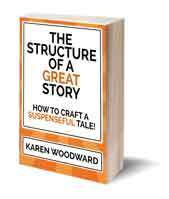 These needn’t be books in your genre, or even fiction books! I read a fair amount of non-fiction these days, mostly research material plus the occasional biography or cookbook (I LOVE cooking!!). - Share pictures of your pets. What pets (if any) do you have? Share pictures of them! If you don’t have a pet, consider sharing a pic of a cute nicknack on your desk or perhaps a plant. - Share pictures of nature around your home. Pictures from walks you’ve taken around your where you live. If these walks are close to where you live I would advise stripping out your geolocation. Also, you might not want to post pictures of anything that would uniquely identify where you live, unless that information is already in the public domain. - Share pictures of you! Not everyone will feel comfortable with this, but (as I discuss below) you might think about putting up pictures of yourself that were taken at (say) a keynote speech you gave or a signing. 2. Instagram can help you grow your community. - Share your new book cover. I love it when authors share their book covers, especially if they show a picture that almost made it to the cover. In general, I like it when an author gives me a peek behind the scenes, when they share a bit about the process of putting a book together. - Be social! Use Instagram to get to know other writers and readers. Like and comment on the pictures of others. Don't do this in a mechanical or spammy way, be genuine! If you're a writer then you're also a reader, so follow your favorite authors, get involved in discussions. Comment on photos that grab you. - Let your readers help choose your artwork. Often writers create more than one version of a book cover. In this case it doesn’t hurt to ask your readers which book cover they’d rather have. - Pictures of short passages from a book of yours. I love this! Composition and design is not my strong suit so I love looking at what other authors have done in this regard. Also, I have been inspired to read new authors and have not been disappointed! - Pictures of your other creative endeavors. Do you draw? Doodle? Paint? Hike? Bike? Chances are you have many different avenues for expressing your creative drives. Writers are artists, indulge your creative self. - Share your upcoming book signings and appearances. As I mentioned, only a few of your die hard fans will be able to make any one of your signings, but by sharing pictures of the event all your readers can share in the experience. 3. Instagram can help you nourish your community. - Share images of what inspires you to write. The picture of a bead of rain on a green leaf. Of babies, puppies, kittens, your bookshelf, the stuffed toy poodle your mom gave you when you were five and that helped chase away nightmares. Or your dying cactus. Anything. Whatever inspires you. - Share images which remind you of one of your characters and explain why. These needn't be photographs of people (though they often are). They could be of a pensive giraffe or a spectacular sunset or a happy kitten. Or perhaps something darker. The point is, it's up to you. You can see through the eyes of your character, you know what he/she would be drawn to. - Share images of your book signings and speaking engagements. Most of your readers won't be able to attend any particular speaking engagement you have, so share pictures! Even better, share a video of the event. - Share art for your book. This can be a book cover, or art for a book cover that wasn't used, but it could also be art that one of your characters created. It could be a picture of their goal, the object/person that they want more than anything else in the world. 4. Use Instagram to nourish your own creativity. People who are creative in one area are often creative in other areas as well. Painting, drawing, designers, decorating, cooking, to name only few. Take pictures and share them! Often authors don't have any other outlet for these hobbies, but your readers would love to know more about you, about your other passions. Share them! Who doesn’t like a contest? This can be a fun way to engage with readers and—bonus!—it encourages your readers to share their own creative efforts with the world. How do you set up a contest on Instagram? Good question! Instead of going into this process here, I’ll refer you to How to Run a Successful Instagram Contest by Krista Bunskoek over at Social Media Examiner. After you’ve created a contest, it’s a good idea to set up a page on your website that spells out the rules of the contest, what prizes you’re giving out, instructions on how to enter, and so on. For example, let’s say you create a contest that asks your readers to take photos of themselves while holding your latest book. Perhaps ask them to dress as their favorite character from the book. You could give out prizes for most creative costume, for best-dressed, and so on. If you do this, take a picture of yourself in costume holding your book. It will embolden others and act as a convenient example of the sort of thing you’re looking for. Miranda July And 15 Other Literary Instagrams You Should Follow, by Claire Fallon at The Huffington Post. Instagram for Writers, by Crystal King on Grub Writes. Today I'm recommending a book I'm reading for the fourth time: Sparkling Cyanide, by Agatha Christie. I think this is one of Christie's most charming mysteries, equal parts love story and murder mystery. From the blurb: "Agatha Christie's genius for detective fiction is unparalleled. Her worldwide popularity is phenomenal, her characters engaging, her plots spellbinding. No one knows the human heart-orthe dark passions that can stop it-better than Agatha Christie. She is truly the one and only Queen of Crime." That's it! I'll talk to you again on Wednesday. Until then, good writing!